With such a huge selection of printers to chose from how can you decide which printer is right for your home needs? As with most products nowadays there becomes so many different makes and models available that it can become overwhelming. Before deciding on the best printer for 2014 we have considered a vast number of criteria. Firstly when talking home printers we usually are referring to Inkjet Printers and not laser. Reason being is that an inkjet printer is a much cheaper to purchase (Colour Printer) and also cheaper to use and maintain in the home environment. The first thing to avoid when buying a new printer is to become a miser and go for the $39 Canon Printer which is at the front of the display. The inks for these are super expensive and the colour cartridges contain about 30% of the ink compared to a printer using individual colour tanks. As a general rule always avoid printers which use only 2 ink cartridges. Avoid printers which use a piezo print head. In saying this it basically eliminates every printer except the Canon range. I might sound biased however most people in the printer industry are aware of the brilliant design of the Canon's Thermal Print Head. 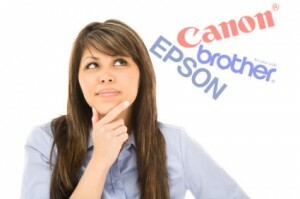 The Canon print head lasts longer, very rarely clogs and is the only printer which still uses a removable print head. The award for the Best Printer for 2014 goes to the Canon MX726 Inkjet Printer. This printer is a multifunction print, scan, copy and fax with full duplex capabilities. It has full wireless and mobile connectivity as well as double sided printing capabilities. One of the best features of this printer is that it utilises 5 separate ink tanks which can be replaced individually as needed. These printers run perfectly well with good quality compatible inks and will never give any problems in regards to incompatibilities or print head clogging. Other features of the Canon MX 726 is the ability for printing direct from cameras or mobile devices and it also has its own card reader for printing from memory cards etc. 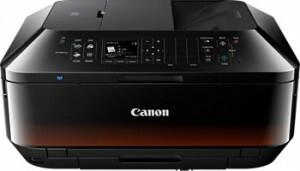 Without going into all of the technical jargon concerning print speeds and resolutions let me summarize by stating that the Canon MX726 for home use will be the most reliable, full function printer and using compatible cartridges one of the most economical and trouble free printers on the market.